Junior League of Fresno Celebrates 60 Years! For 60 years, the Junior League of Fresno (JLF) has been a driving force in the community. JLF has served as an outlet for women to develop leadership skills and made lasting improvements in our community with a focus of enriching the lives of children. Our commitment has remained unwavering: to develop exceptionally qualified civic leaders who can identify a community’s most urgent and pressing needs and address them with meaningful and relevant programs and initiatives that not only improve lives, but change the way people think. 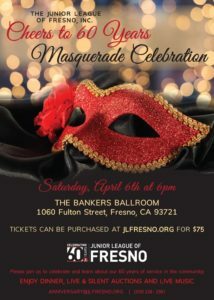 In celebration of 60 years, this April we will have a Masquerade Ball to raise money for Junior League of Fresno. Please join our celebration on the evening of Saturday, April 6, 2019 to honor 60 years of JLF making a difference in our community. The fundraiser will include food , drinks, silent and live auctions and a guest speaker from the Association of Junior League International.